Luxurious tablet-arm chairs don't have to be impractical. 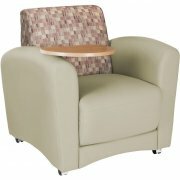 An interplay between style and function, this line is a great choice for your library or waiting area. Its smart design is sure to impress everyone who enters your office or reading room. 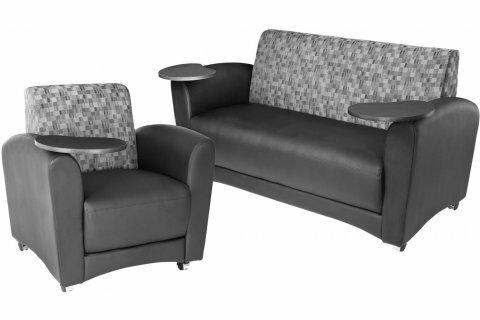 Sofas and chairs feature attached swivel tablets which provide an accessible work surface, and easily swivel away when not in use. Rearranging your space or relocating? Four locking casters and a built-in handle facilitate easy transport. 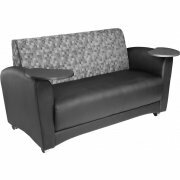 This reception seating line combines a classic appeal with an attractive contemporary design, highlighted by a choice of sleek color combinations. Convenient: Writing surface is there when you need it. Easy Mobility: Rolls into place on four locking casters. Easy Transport: Metal handle on the back simplifies transport. Appealing: A choice of professional colors accents a classy contemporary design.